We used our Safety 1st Complete Air Convertible Car Seat for many years until my son grew out of it. I did my research and found that this convertible car seat would fit my family very well. 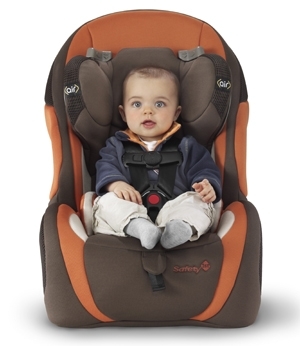 See why we recommend the Safety 1st Complete Air Convertible Car Seat. I have spent the last few months looking at convertible car seats for BJ. He is rapidly outgrowing his infant seat and we are going to have to move him into a “big boy” car seat. 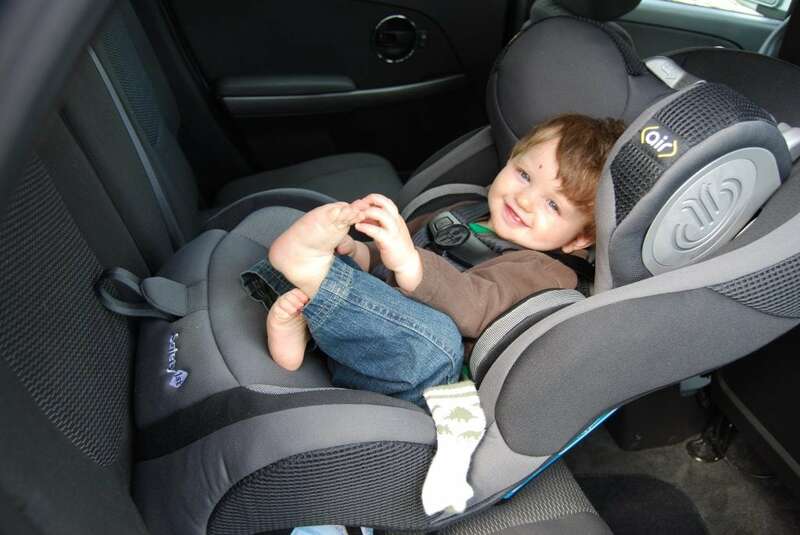 The most important factor for us when selecting a car seat is safety. I want the safest car seat on the market for my little man. I am already paranoid being a first-time mom, so I want to know that if anything happens my little guy is as safe as he possibly can be sitting in his seat. In my research, I learned a lot about car seat safety and a lot of alarming car crash statistics. In the past 20 years side impact crash fatalities have increased by 20%. Air Protect™ Technology has been designed to defend against the biggest threat to children on the road today; side impact collisions. Side impact are by far the deadliest type of collision for children, accounting for one in three child fatalities; nearly all of which are caused by head trauma. The placement of Air Protect™ Technology on the car seat diverts crash forces away from a child’s head, the most vulnerable place in a side impact crash. 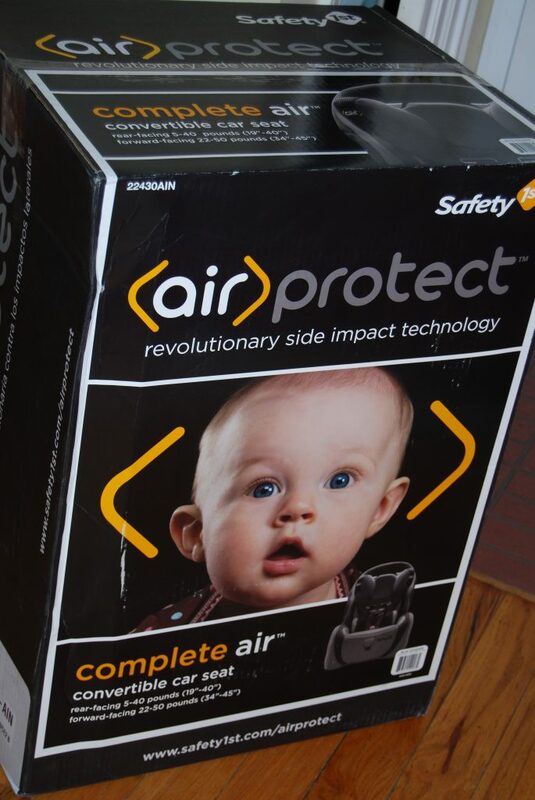 We recently received a Complete Air Convertible Car Seat from Safety 1st for our review. I was so excited to see the box arrive from the FedEx man. The box became a big hit with BJ. He has been playing with it ever since it came. We read through the instruction manual and began the installation process. We appreciate that the seat is a convertible because we still need it to be rear-facing for a few more months until BJ is older (it fits rear facing from 5-40 lbs and forward facing 22-50 lbs). Installing the car seat in the rear-facing position was difficult at first. We actually had to go to the installation videos on Safety 1st’s website in order to install it correctly. The video was wonderful and I highly recommend viewing the videos before attempting to install the car seat. A word to the wise on installing rear facing, you might need a rolled up towel to stick under the front of the seat in order to get it to level out correctly. BJ loves his new seat. He looks very comfortable riding rear facing and he has plenty of leg room. I was a little worried about the head flaps (that cushion his head with air) restricting his view, but he doesn’t seem to mind. We can easily strap him into the seat and adjust the harness is extremely easy thanks to the QuickFit Harness System that adjusts the harness height from the front in one easy step without uninstalling from the car. The seat also comes with a detachable cup holder for BJ when he is a little older. 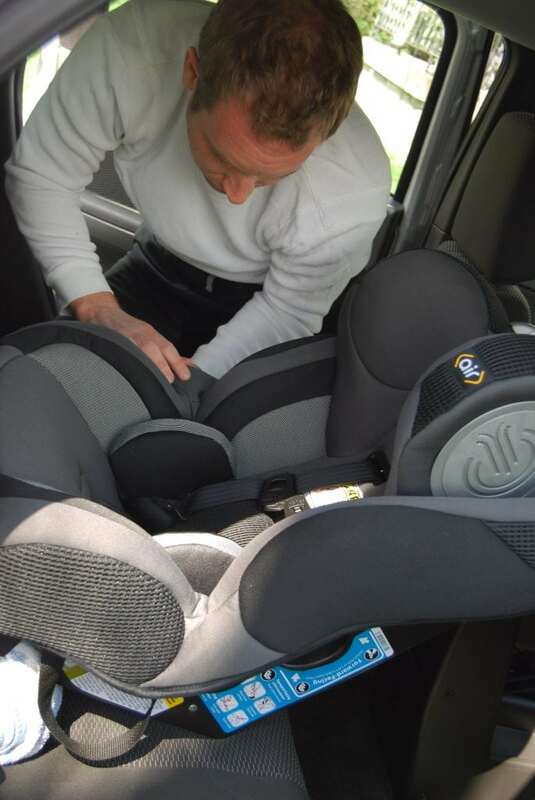 Overall we thought that the car seat was a little difficult to install rear facing but easier after watching the installation videos. In spite of the one negative, we love this car seat. It looks great, BJ looks comfortable, and best of all I feel like I have my son in the safest car seat on the market. A Mom’s peace of mind is priceless. For more Car Seat Reviews check out our thoughts on the Safety First Advance 70, The Britax Marathon 70, and the First Years True Fit Rebound Convertible Car Seat. You can purchase your own Safety 1st Complete Air Convertible Car Seat from Amazon, Target, Walmart, Sears, and other retailers for MSRP $219.99. This product review was made possible by Safety 1st I was not compensated for this review other than a product sample provided by Safety 1st. All opinions are 100% mine. I like the Naturals bubble bath. I am a facebook fan of A Mom’s Impression. What I could really use right now is the babyproofing kit for drawers and cabinets. I love the Disney Propack Travel Stroller!!!! I would love to try the AeroLite LX Deluxe Stroller! I follow on twitter nd tweeted! I would love the AeroLite LX Deluxe Stroller. Looks lightwieght and its cute too! I’d like the babyproofing stuff (a large assortment). I just had my second and while I didn’t babyproof much with our first, I’m sure I won’t be able to keep up on what this one is doing as well. I also like the happy harmony swing. The Vineland Solid Wood Bassinet looks lovely. I would love to try the AeroLite LX Stroller! I like the AeroLite LX Deluxe Stroller. I like the Explorer Travel System. I like the Go Hybrid booster seat. I’d like to try a bed rail from safety 1st. My 18 month old has just started sleeping in his “big boy bed” and we’re going to need something to keep him in it! I like the AeroLite LX Travel System stroller. I Follow A Mom’s Impression on Facebook. This would be great! I also like the Acella™ Alumilite Convenience Stroller. Thanks! I would love to try their AeroLite LX Deluxe Stroller! I would love to have the Avila Convenience Stroller. SOunds and lights activity walker looks cute. I commented on the Triscuit Home Farming post. I want to try their easy fit secure gate! My evenflo just are not tall enough! I like their Nature Next line – particularly the bamboo gate. It looked much nicer than plain wooden gates when we saw them at Walmart, too. I would like the Avila Convenience stroller. I would love to try the soothing bassinette! I like their ProGrade No-Touch Thermometer. It looks so convenient for checking temperatures without waking the little ones up. Thanks for the great giveaways!! I’d love to own the Easy Care Booster Seat! I could definitely use their prograde cabinet lock! I’d love to have the Two Ways Tandem Stroller. I have the Car Seat Giveaway button. I’d like the Prism Color Video Monitor. I love the easy care booster seat. I am all for easy care. I can’t wait to try the Natural Skin care lotion! And I loved how he loved the box. 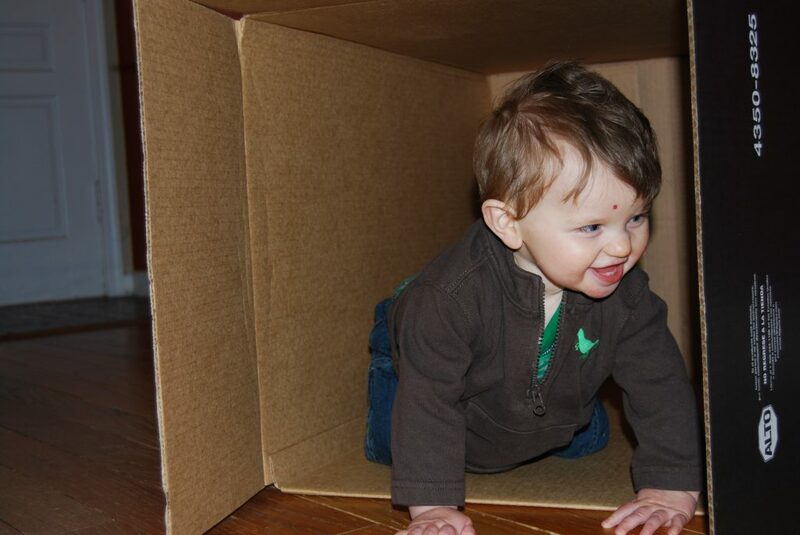 When we bought our last carseat, my toddler and 5 year old played with the box for weeks! Commented on the UBP post! I would love their solid wood bassinet… got another due in July! I subscribe by email post 2! What a great giveaway – perfect for our upcoming little one!! I’m also loving the Acella™ LX Travel System – love the bright yellow!!! Following you on twitter as @champagnewisdom – and tweeted!! Just fanned you on facebook!! I follow A Mom’s Impression on Facebook. ID: Merrie L.
I would like to try the bath toy bag! I love the Vineland Solid Wood Bassine-very pretty! I just became a facebook fan under the name Susan Chester. I would love to try the Vineland Solid Wood Bassinet. Thanks for the awesome giveaway! #1 I am an e-mail subscriber to your blog. #2 I am an e-mail subscriber to your blog. I need some of the cabinet slide locks. I think the disney all in 1 swing is something i would be interested in. I also need cabinet locks. LOVE this! Our chunk it about to outgrow his car seat! I like the AeroLite LX stroller! I would love to have their air complete infant car seat for out new baby on the way! I subscribe by e-mail #2. I would love the Serve ‘n Store LX Highchair. I’m following you on Twitter and I tweeted about the giveaway. I commented on a non-giveaway post – the 1st birthday for your son! I have the car seat button on my blog! I’d like to try their comfy seat high chair! I’d like their secure top bedrail. I’d love to have the Close View Monitoring System – I hate having to peek into my son’s room to check on him and praying that he won’t see me and start fussing. I would like to try their Two Ways Tandem Stroller. I’d like to get the Infant-to-Toddler tub. Oh, dear! I’ve already entered this giveaway, haven’t I? Can you remove my last comment and this one, please? Very sorry! I actually like Safety 1st products from the experience I had with the children and nannying. But now that I expecting my own I am very interested in trying one of their pack and plays. My personal choice would be Py148 travel ease deluxe play yard. I’d love to have the Nature Next Bamboo Booster Seat. Another daily tweet – cuz I want to win this car seat SO BAD! We’re having TWINS in a couple months! I really wish to win the Safety 1st complete air car seat for my 3 year old, because his little sister almost 1 needs his current seat. Another product of Saftey 1st that sounds pretty interesting to me is the nature next bamboo booster seat and all the other eco friendly products. Alarm Security Gate would be a great product . your reg button in the in the right scrolling sidebar. I couldnt find a comment button… I would like to try http://www.safety1st.com/usa/eng/Products/Travel/Car-Seats/Infant-Car-Seats/Details/2560-IC034AOB-Designer-Infant-Car-Seat Its the Designer Infant Car Seat. Im due in October and absolutely love my son’s Safety 1st carseat that he has. I totally trust this brand. I’d love to have the Disney® Musical Deluxe™ Bouncer! I like the smart rewards potty. i like the ProGrade Secure View Mirror, so i can always keep an eye on my baby without not looking at road. The 23″ Security Gate from Safety First is just what I am looking for – to keep grandchildren and pets close but not too close. I would like to try the Screen Door Saver. I would like to try the Baby & Pet Gate. I would love to try the Sojourn™ Travel System. Thanks! I am amazed at how far technology has advanced since my first child was born 16 years ago. I would love to have the Prism Color Video Monitor. Great giveaway! I would also like to try the Disney lights walker, it looks pretty cute, but I would need 2 for my twins, they could race, hahaha! Soothing Bouncenette is something I would love to try, it looks like it would be great for a baby. I subscribe to A Mom’s Impression by Email #1. I subscribe to A Mom’s Impression by Email #2. I would like to try the Travel Ease Play Yard for traveling. I would like to try the Alarm Security Gate. Thank you for the chance to win. I like the Jitter Bugs toys. I’d like to try the Jaunt™ Travel System. I want to get the Snack and Scribble Booster Seat. Alarm Security Gate, would be great to have! I would like to try the Cabinet Slide Lock. I also would like to try the Sound ‘n Lights Discovery Walker. I like the Beagle Buddy Potty, way cool! I also like the Close View Monitoring System. Thanks! I follow you on twitter (Fine Insanity) and I tweeted. I also like the Vineland Solid Wood Bassinet. I like the TR003 Aerolite Travel System. I’d like to see a review on the Prism Color Video Monitor. I would love to try the Avila™ Convenience Stroller. I would like to try their Explorer Travel System stroller. Very very nice! Would love to get Ian the Beagle Buddy Potty #07048. I would love to try theExplorer Travel System stroller! I like the Acella LX Travel System. I love the 22187 Alpha Omega Elite Convertible Car Seat. I’m your fan on Facebook user Lisa G.
I also like the Travel Ease™ Elite Play Yard. Very affordable!